What are the distractions in your life that are holding you back from discovering and fulfilling your God-given purpose? It could be that dream job you are obsessing over, your phone & social media or the boy with the white teeth who gives you a little attention and has you crooning over the lies that you believe are true. WE look at the beginning of each year as a do-over. We create a list of goals and make resolutions, but what purpose does ANY of that serve if we haven't taken the necessary steps to get rid of those things that had us bound and held up back in the previous year/s? You'll just be repeating the cycle and ABSOLUTELY NOTHING will change. Another year will go by and you'll look at your social media to reflect and depression or frustration will set in because there will have been no growth. I've learned that it isn't enough to just set goals. 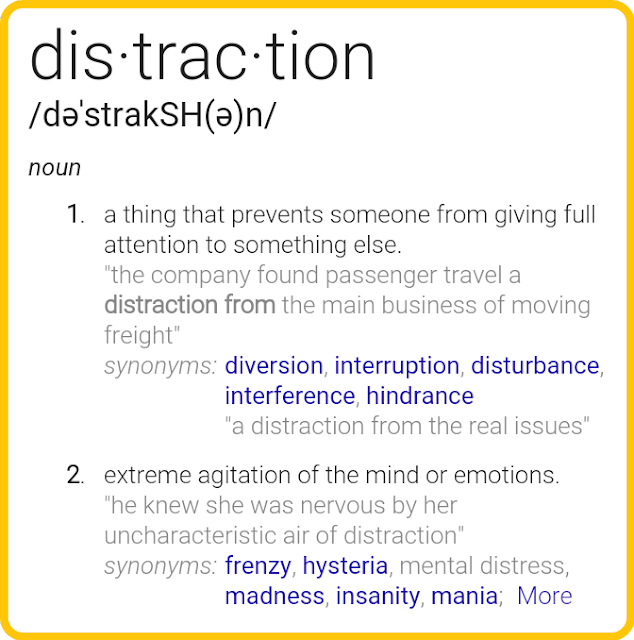 We must be intentional about removing every distraction that keeps us from our purpose. Fast if you need to. Deactivate Facebook, etc. for a week or for a specified time during the day. Chill at home on some weekends. You don't always have to go out and party, because I guarantee you won't be missing much of anything. Make some chili and tea on those cold Winter days/nights and dig into God's words. Cut people off that mean you no good or aren't beneficial to your growth. Trust me, I know it's hard. It hurts to get rid of people and things that you've grown super attached to, but would you rather be stuck, hurt, lost and confused for the rest of your life? I know I wouldn't, and if you're as sick and tired of being sick and tired as I am I challenge you to break free. So what this is your 3rd or 10th time trying. God hasn't given up on you so don't give up on yourself. Just leg go of the distractions and embrace change and growth.